Aniject 3 Part 0.3ml U100 Insulin Syringes are non-toxic, non-pyrogenic, and sterile syringes for use with U100 Insulin only. 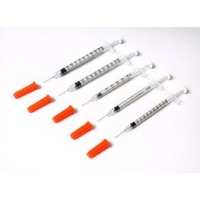 Each syringe has a non-traumatic 30G x ½” (12.7mm) bevelled needle and has been made out of a durable plastic with a latex free piston. The syringes hold up to 0.3ml (30 Units) of U100 Insulin and are marked in clear graduations of 0.01ml (1 unit) for easy and accurate dosing.